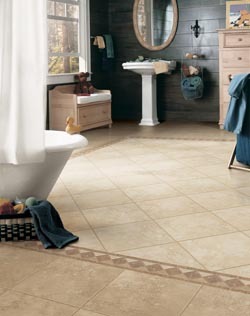 Are you looking for brand new ceramic tile flooring to replace the old flooring in your home? You’re making a smart flooring choice. Ceramic tile has been used for centuries and is one of today’s most popular flooring options. Our flooring store sells a wide variety of high-quality ceramic floor tiles in a range of colors to match your design style. Whether you want something bright and vibrant or you prefer subdued earth tones, you are sure to find everything you need to turn your worn, outdated floors into the floor of your dreams. If you appreciate a stunning blend of beauty and practicality, you will absolutely love your new ceramic tile floor. Ceramic tile is long-lasting and durable. It can retain its original look for decades. It is one of the strongest flooring materials available, and remains undamaged by water or moisture. This study tile holds up to heavy traffic without scratching or denting. For durability, a ceramic tile floor is a winner. Wondering about how to maintain your ceramic tile floor? Ceramic tile requires virtually no maintenance. Ceramic tile is stain resistant and cleanup is as simple as a quick go-over with a broom and occasional mopping with a household cleaner and water. Looking for versatility? Ceramic tile isn’t just for floors. Walls, countertops, backsplashes—almost any surface can be enhanced with ceramic tile. Of course, style matters, and the many styles of ceramic tile are certain to suit any taste. From a southwestern, terracotta look, to ceramic tile that gives an authentic wood plank appearance, you are sure to find an option to fit your style preference. A well-designed and well-installed ceramic tile floor can add value to your home, increasing resale value. Ceramic tile does it all, looks clean and classy, and is also one of the most budget-friendly flooring options available. It’s an all-around smart flooring choice. Why Choose Our Professional Ceramic Tile Floor Installation? Ceramic tile installation is a complicated process. An inexperienced installer may appear to be a value, but often ends up adding unnecessary expense and problems. Mistakes in measuring and cutting causes wasted material, more trips to the store, and more overall time needed to complete the installation—resulting in added cost. An improper ceramic tile install causes loose tiles, broken tiles, and cracked grout, necessitating expensive repair costs. Inexperienced ceramic tile floor installers often produce an unattractive finished product, with uneven tile spacing, layout, and cutting, incurring the expense of replacing the tile. And no floor lives out its full life expectancy without a proper installation. Don’t let that happen to you and your new floor. We have a team of seasoned craftsmen with extensive experience installing ceramic tile flooring. When you choose our professional ceramic tile floor installation, you can sit back and relax, knowing your floor is installed the right way, the first time. Our installers are not only skilled, but also courteous and respectful of your home and your time. They work fast so that you can use your new floors right away. Prevent the extra expense, stress, and problems with our professional installers. You’ll be glad you did. Contact us for more information about installing durable, stylish ceramic tile floors in your home. We proudly serve the communities of Rochester, Byron, Kasson, Eyota, and Dover, Minnesota.